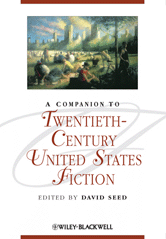 Through a wide-ranging series of essays and relevant readings, A Companion to Twentieth-Century United States Fiction presents an overview of American fiction published since the conclusion of the First World War. Features a wide-ranging series of essays by American, British, and European specialists in a variety of literary fields. Written in an approachable and accessible style. Covers both classic literary figures and contemporary novelists.